After a long hard winter many teens are anxious for summer to arrive. They might have big vacation plans, or they might be looking for ways to earn their own money, which means they need to find summer job ideas for teens. Summer is the perfect time for teens to use their amazing skills to make money. If you are a teenager, consider figuring out ways to use your time off this summer to find a job or start a small business, to earn some money. As a teen these days you have so many more options when it comes to making money. You can get a summer job, or do work online, or even start your own small business. But you stand a much better chance of making money this summer if you start getting organized well ahead of time. If you wait until the day after school is out to begin looking, most of the good opportunities will already be snapped up by someone else. Use the months leading up to summer break to figure out what you want to do, who you need to speak to, what tools or skills you need, and how much money you want to make. Once you know what you want to do, get the word out by contacting the right people, and begin building new relationships. Here are some different ideas to help teens get started today. If you enjoy taking photos and have access to a nice camera you can take pictures and sell them via the stock photo websites. Setup an account on several stock photo sites. Next, head out to the park or to the lake and take scenery pictures. Go downtown and take pictures of the buildings. Review your images and upload the best ones to the stock photo sites. Check out how this person made $20,000 selling stock photos, along with some valuable tips on how they did it. Do you enjoy working outside during the summer months? If you have access to a lawnmower and a rake you could setup your own small business to mow the lawn, rake the leaves, and keep gardens free of weeds. Many people do not have time to do this during the summer when they work during the day and want to spend their weekends relaxing. They are happy to pay someone else to mow their lawn every week and look after their gardens. Begin by approaching friends and then speak to your neighbors too. As a matter of fact, we found a poster on our doorstep this morning from a lawn mowing and gardening business. Yes we still have snow on the ground, but these people understand that they need to contact people now and get new clients signed up for the upcoming summer months. You could charge your clients between $25 and $35 a week to mow their lawn if they have a small residential yard. Charge more for homeowners with larger front and back yards. Leave their yards clean and beautiful looking and they will start to tell their friends about your services too. Etsy has grown like wild fire over the years and many people of all ages are earning a nice income by selling a variety of different products. Check out their site and browse through all of the different categories to see if there is one that you could work with. Interested, but need some help on how to get started on Etsy? Stephanie from SixFiguresUnder.com has graciously turned all of her Etsy experience into a free series of step by step instructions that anyone can use to build and promote their own Etsy store. Click here to check it out. As a teen you can make money by creating a YouTube Channel. Young girls do makeup tutorials or exercise routine videos. They also do fashion tip videos. The videos are monetized via Google Ads. Perhaps you can find a friend to partner with on this idea. Fiverr is another way for teens to make money this summer. There are so many different types of gigs you can do. For example, if you live in a popular tourist location you can offer to send people postcards from your location. I know it may sound weird, but people like that stuff. Now that you are out of school for the summer your creative mind is probably overflowing with ideas. Look at apps that you are already using and see if you can come up with an idea for one that has not been created yet. Or find one that doesn’t work the way it should and build a new one that is better. If you have the talent to come up with ideas, but you lack the knowledge to build an app, look for a person to partner with. When I think of teens and summer jobs I think of ice cream shops, sandwich shops, local cafés, food trucks, and more. Other restaurant jobs include dish washer, host and hostess, waiter, waitress, and so on. Instead of heading to your typical fast food chain, consider small, local shops that may be busier through the summer and need extra help. Related: At What Age Should Your Teen Get a Job? Parents really struggle in the summer when they have to continue to go to work every day but now their young children are out of school. 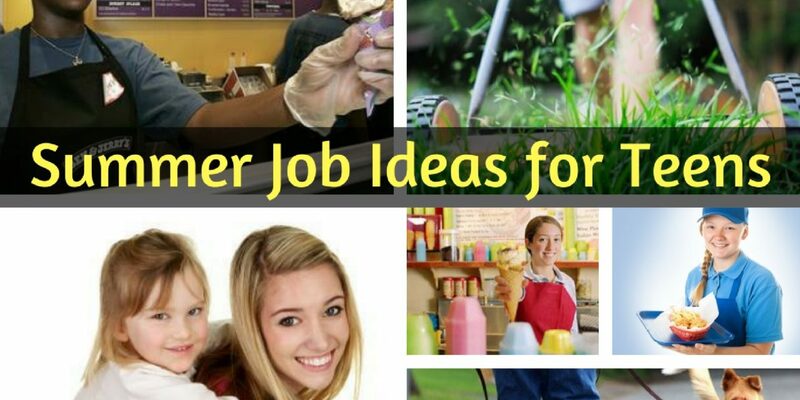 If you enjoy babysitting, now, in April, is the time to find a summer job. Spread the word that you are available. Make up small posters and pass them around your neighborhood. Ask your parents if any of the people they work with will need a babysitter this summer. Depending on your age, you could look at becoming a housekeeper for the summer months. A few regular weekly clients are all you really need to keep you busy and help you make money. Again, spread the word through your neighborhood, and see if you can put small posters up in local coffee shops, community centres, or at the library. We all know that summer means summer vacations. And people with pets are always looking for someone to take good care of their pets while they are away. If you love cats and dogs this may be a great summer gig for you. Depending on your age and whether or not you have access to a car, you could offer several different types of services as a pet sitter. You could offer to walk people’s dogs, feed and look after their cats while they are away and also look after their house by ensuring it is secure, all plants are watered, and making it look like someone is home. Are there seniors in your neighborhood that you could use some help? Offer to get groceries for them, wash their car, clean out their basement, and help around the house. As a teen, whether you find a summer job working for someone else, or you start your own small business, always work hard, be kind and patient, and develop good trusting relationships with all the people you work with.